Proclaim 16, the NRB International Christian Media Convention, is a four-day, jam-packed event that connects, equips, and edifies thousands of Christian communicators - from broadcasters to producers, writers to publishers, managers to pastors, artists to consultants. This is a "must attend" event for Christian communicators. You will hear outstanding internationally known speakers and artists, have the opportunity to attend numerous networking events, and receive helpful industry insights. If you've attended before, you know the Convention is only half of the attraction. Experience our award-winning Exposition, featuring approximately 200 companies. The booths of the exhibit floor make up an active marketplace of products and services that can expand and enhance your organization. From innovative ideas and endeavors to must-have tools and equipment to organizations that influence millions around the world, the Expo has it all! 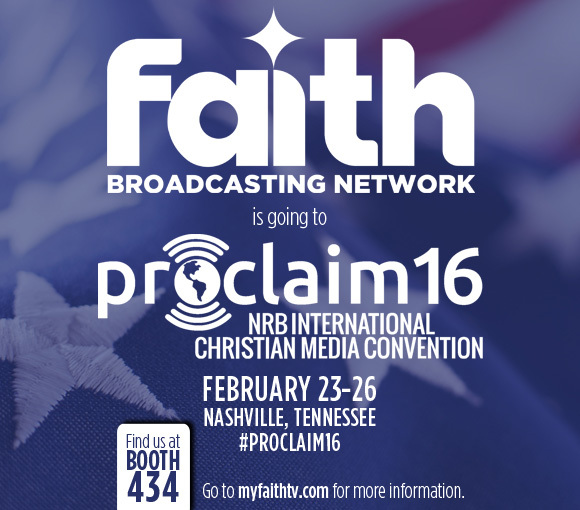 Faith Broadcasting Network will be one of the exhibitors at the Proclaim16 Conference. You can find us at Booth 434. To see the floorplan please click here. If you would like to see the other exhibitors attending the conference please click here.